Have a fun and safe evening! See you in 2010! 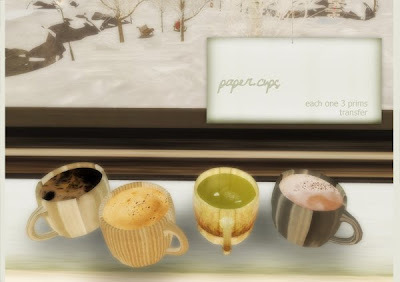 My Top Five Favorite Things in SL for 2009--A Challenge! I woke up at 3am last night thinking about these things and wanted to post them. I'm also going to put this out as a challenge to any bloggers who would like to do it. Basically, just list your five favorite SL or SL related things for 2009. It can be skin, hair, a gadget or person. It didn't even have to be created in 2009 but it just has to be new to you. Oh, and you can cheat a little with the five things too as you will see I did. 5. MudHoney Photobles. These are a blogger's best friend! I've raved about these before on my blog about the ease of rezzing and derezzing them. You can change the furniture out in them and put your own stuff inside and since the items are copy, you can put some of the furniture in your own home as I have done. I believe, Rayvn has done six of these so far in 2009 and I can't wait to see what she does in 2010! 4. Japanese Sims/Creators. A whole new world of Japanese Sims/Creators was opened up to me this year thanks to Jordan Giant. 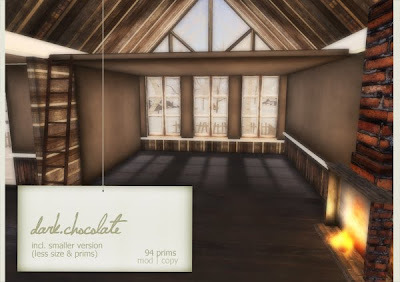 After visiting her snow.white skybox and inspecting where she got the majority of her furniture, I was on a crazy whirlwind of discovery! I hopped from sim to sim and store to store discovering low prim, beautifully textured and reasonably priced furniture, housewares and plants! Some of the places to visit are Drowsy and Albero. 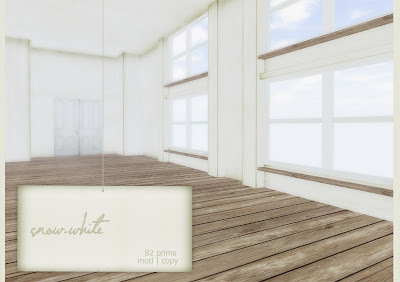 3. snow.white Skybox/Loft. My number four favorite leads right into my number three. When I saw this skybox on exchange, it was love at first sight! It's simple, pure, clean and fresh looking! I loved the quality and the size of it. You can buy it on exchange or visit Jordan's in world shop nordari. 2. LeLutka Estelle Skin. In 2009, I became a skin whore! I used to be loyal to one skin designer and wear that skin for months and months before I bought another fat pack from somewhere else. Now, I change my skin as often as I change my clothes in SL. However my favorite skin so far is the free LeLutka Estelle skin that I got at LE.LOOK. I think I am going to have to break down and buy a fat pack! 1. Plurk. Last but not least is Plurk. It is not really in SL but it is SL related. I have met so many great people on Plurk that I would not have met in world. I got to know my already existing SL friends better and it is a great way to keep up with all that is SL when you aren't able to log in. So there you have it my five favorite SL things of 2009! So what are yours? Shag Has The Perfect Funiture set for New Years Eve! Are you having a New Years Eve party this year at your home or club? Then this new Living Room set called Disco Sh!t from Shag would be perfect! The whole set is all shiny and glittery and would be great for a party! Since the set is called Disco Sh!t and is inspired by the 70s, the pictures are based off of a popular 70s activity. However, if the pictures are not your thing, then you can take them down and put up some of your own. You can purchase the pieces separately or as a set for $984.00. So get to Shag and check out this cool set and some of her other awesome furniture she has available. I got a Christmas present! When my friend and neighbor Quaintly read my previous post about how bummed I was that the Christmas tree display was not for sale from Blonde. She sent me a Christmas present! 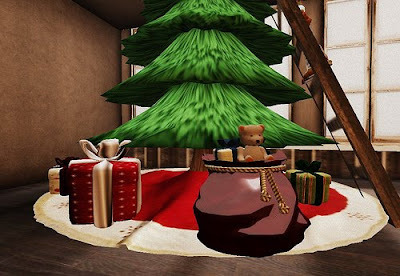 This is special to me because no one has ever sent me a Christmas present before in SL and I love this tree! Look at it! It has presents and a really cool decorating the tree pose that is animated! 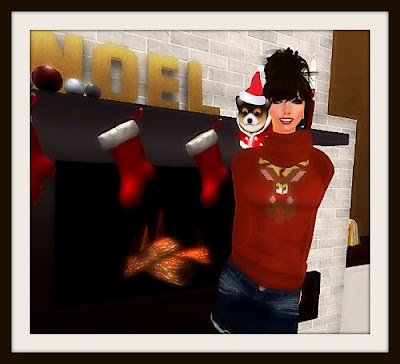 It is from a store called Wildfire Designs that I had never heard of so I went and checked them out and they have some other really cute Christmas items out that are reasonably priced. Look at this great Christmas set up! You get presents, a Santa bag, animated pose and a tree skirt! There are even little ornaments hanging from the ladder ! Look at all these presents! I guess, I have been good this year! Thank you again Quaintly! You made my day! I love this time of year but I hate Christmas decorating in RL. The boxes from the attic are dusty and dirty and they get the rest of the house dirty. I have boxes everywhere and even though things are labeled I still can't find what I'm looking for. After I'm done, I have to clean the pine needles and icicles that get everywhere and that I still find in some odd place in the house in June. I won't even get into complaining about when it is time to pack the stuff up and put it away! Anyway, I found this great decorating the Christmas tree set up at Blonde. Unfortunately, last time I checked it is not something that is for sale, which is a bummer because it is low prim and I really love it! There are alot of other great things at Blonde that you can purchase though like almost everything else you see in this picture! Taking these decorations out and setting up the tree has left me tired! Can't reach! Must move sliders to get longer arms! The cute blouse that I am wearing is from Ingenue and has been out for a few weeks now. I am so behind in blogging! It is the Judy blouse and the jeans that I am wearing are the Jane jeans. Ingenue is currently doing a 12 days of Christmas at the shop where you can get a gift under the Christmas tree until the 24th. Check out the blog for more information. Blonde for great furniture and accessories! Fri.day hair--dont' remember which one and too lazy to search for it! Jordan Giant built a new house! In case you haven't noticed, I'm her biggest fan....and I'm not saying that in some weird Kathy Bates way, either. I'm at work now so this post will be quick and dirty. The pictures below are right off of Jordan's SLexchange page that I am showing. They aren't mine. These pics are hers and I hope she doesn't mind me using them but I wanted to get this post out and share something that I really love! Also, she has some new freebie coffee and tea papercups. Check out the house here on SLexchange or she has a new shop too but I don't have the slurl. Check her profile pics and it is probably listed there. Oh, one last thing....the house does not come furnished! She just shows you how you could decorate it! I repeat IT DOES NOT COME FURNISHED! I'm just enjoying being out at Butterdish in my Ingenue Rosie overalls in black and Penny hair by Gritty Kitty. Um, I should probably be running by now? Gritty Kitty Penny Hair in Brown. Poses by Storin in picture one and LAP in picture two. 40% off sale on Tuli Hope Fat Packs! Quick post in case you had not heard. Tuli is having a 40% off sale on her Hope fat packs of skin until Sunday December 6th. Also, all clothes, shoes and accessories are 50% off too. Get down there quick! Who Knew Sci-Fi Could Be So Much Fun! I am totally digging this Sci-Fi posing hallway that Glitterati put out! I don't think I have ever had this much fun taking pictures and posing. I felt like I was in a music video! 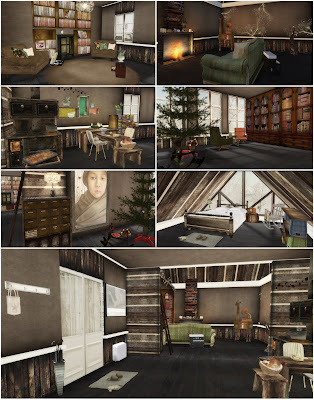 Today there is something old, something new and some freebies, etc. Hey, if you have any tips for how to take a good full body length picture, please leave me a comment. Whenever I take full length photos, they turn out blurry, etc. and cropping or trying to sharpen them just doesn't help. The only thing I know how to use is Picnik. Thanks!